Spunky Little Monkeys: Finger Paints! What kid doesn't just LOVE finger paints? Tuesday night a friend of mine asked if I'd keep her kids overnight so she could surprise her husband with a night out and dinner for his birthday. The kids were all so excited to have a sleep over with Bubba and Bella :) They came over in the afternoon and after swiming and dinner we headed outside to paint beautiful masterpieces! As you can tell from these pictures they had a BLAST! Kaleb and Christopher decided to work together and used some templates to create an animal sports themed picture. Bella and Emily decided to make a paint pallet picture with a sample of all the different colors we had to paint with. Emily couldn't resist painting her name ;) she loves to write her name! 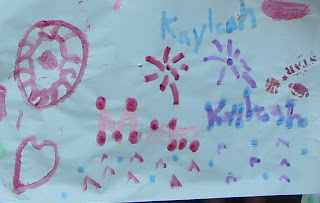 Kayleah painted a beautiful picture with her's and my name with fireworks. I don't know what happened to my close up picture of her with her art work? but here's a close up from the group picture. Sarah used a couple of stencils as well and painted a castle with a princess...so Sarah! she also did the big hearts and flower shapes you can see in the big group photo. Bubba wasn't real interested in painting on the paper....he was more interested in painting on himself. What was hilarious was that as I was taking pictures of everyone with their artwork he sat down on Sarah's, picked up the red paint and put a little on his finger and started putting it on his lips!! The kids got the biggest kick out of this! When we were all done painted we took a good look at all the paint that had gotten on the kids hands. They thought it was so funny how much paint was there and wanted a picture of the art on their hands. :) so cute. You are brave!! Finger paint, well any paint, I do not love for my kids!! I am just not that fun in that fun way! Those are great pictures, and they seemed to have had a blast!! Oh, and the fingernails and toenails are darling! Thanks! I'm not always this brave...they all of course took baths immediatly after painting ;) The one thing I haven't been able to like having my kids do is play with play-dough. It makes me CRAZY! It gets stuck everywhere-ugh. But even that I give into every now and again. I tell myself it's so healthy for their brains and imagination-and that works! LOL!